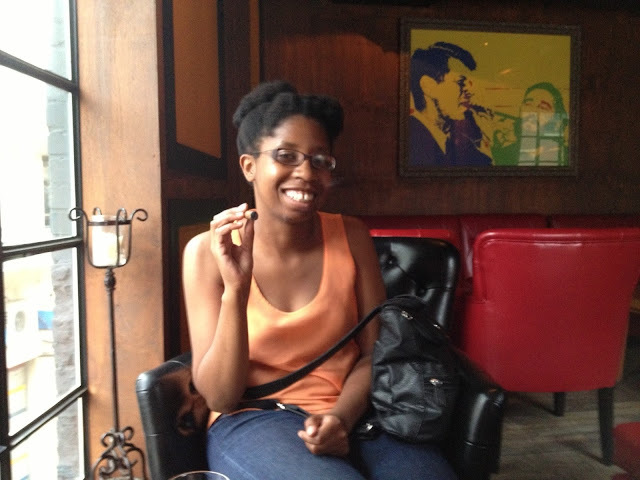 R and I checked out the Burn cigar bar in Gyeongnidan, Seoul this past weekend. I'd noticed it a while ago, but hadn't ventured in there until Saturday. The time felt right to see what a cigar bar in Seoul looked like. I generally don't smoke cigars in Korea because they're expensive, but the combination of the semester ending, the vacation beginning, and being with R brought out the urge to feel celebrate end go somewhere new. We ascended the stairs and immediately fell in love with Burn. Jeremy the sajangnim certainly knew how to decorate the place. All of the dark wood wall panels and leather chairs had us feeling like we were in a scene out of Mad Men. The prices went in accordance with the decor, but I didn't mind the extra expense. We seized the moment and all went well. As much as I relished the chance for a quality smoke, but sharing the experience with R was even better. After a brief explanation, I handed her the cigar and she proceeded to smoke like a champ. Enjoying a Churchill cigar and some Gentleman Jack whiskey. R smoking a cigar for the first time. And on Sunday, we went bowling. Despite loving the sport more than any other, I'd been slow in sharing it with R. Other ideas for dates had always came up, so bowling always went on the back burner. Until a couple months ago, anyway. She'd never been bowling before, which to this son of a league bowler, is an nigh on unthinkable! Alas, here was another opportunity to introduce her to something new. It took three separate outings to finally go bowling because of wait times at the alleys. Young people like bowling more than I'd thought, and we'd faced 1-2 hour wait times every time we'd tried going bowling in Seoul prior to Sunday. Our luck changed at the Han Nam Bowling Center (한남 볼링 센터), near Hangangjin Station. We did have to wait, but we passed the time with a few games of pool. When a lane became available, it was glow bowling time, so she got to experience that aspect of bowling culture as well. We got our shoes and balls and got ready. Because she'd never thrown a ball before, I went first so she'd have an idea of how to do it. I'm not the best bowler (my dad's much better), but I do have decent form; it wouldn't be good form to put a ball in her hand and not show her how to throw it. She gamely picked up her ball and gave it her best throw. R did fine and enjoyed herself. Like the cigars, it was good to finally share this part of my life with her. I've been bowling for 20 years and always have thought of it as the one sport where every person has a good time regardless of his score. This time was no exception. She did well for her first time and had good form. I can't wait to go bowling again. As I said, it's popular among the young people of Korea and it's a fun way to spend an hour or so. It also makes for a good hands-on date. Get to Burn while you can. It may not be around much longer because of changes to Korea's smoking laws. The next post will be about Daejeon. I wanted to get this one out before I moved on to other things. Stay tuned.